Quintairos, Prieto, Wood & Boyer, P.A. 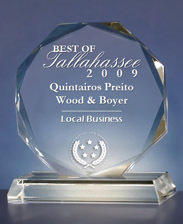 was honored with the “2009 Best of Tallahassee Award” in the Local Business category by the U.S. Commerce Association (USCA). Each year the USCA identifies companies that have achieved exceptional marketing success in their local community and business category. These are local companies that enhance the positive image of small business through service to their customers and community. We are proactive in our marketing initiatives and happy they have had a positive impact on the image of small business in the region,” said John S. Derr, Managing Partner of the Tallahassee office. We are honored by the recognition the U.S. Commerce Association has bestowed on our firm,” said Eric W. Boyer firmwide Managing Partner of QPWB. Quintairos, Prieto, Wood & Boyer, P.A., is a Florida-based law firm providing legal services to corporations, government entities and individuals in the areas of commercial and civil litigation. With six offices throughout the State including Miami, Ft. Lauderdale, Orlando, Tampa, Jacksonville and Tallahassee, and attorneys licensed in several states and the U.S. Virgin Islands.